Sacha Baron Cohen revived the character of Borat in honor of the midterm elections. Cohen appeared on Jimmy Kimmel Live! during election night and revived Borat for a sketch, in which, the Kazakhstan native does a little campaigning, and election tampering, to help the Republicans and President Trump. This marks Cohen’s first major interview or media appearance since his controversial political show Who Is America? aired on Showtime. The character of Borat originated on Da Ali G Show and was later brought to the big screen in 2006 with Borat! Cultural Learnings of America for Make Benefit Glorious Nation of Kazakhstan, which was a huge hit at the box office and did very well with critics. It also helped cement Sacha Baron Cohen as a star. During the sketch, Cohen laid it on very thick, declaring that Kazakhstan had to step up in place of Russia to tamper in the midterms. Cohen, never breaking character, proceeded to push limits and spit in the face of PC culture. In character as Borat, never breaking for a second, he marveled at the fact that women had the right to vote, declaring to a Trump supporter, “I am a racist, it is nice,” and tried to get Jewish people to avoid voting for Democrats by putting bacon on the ground while yelling, “you shall not pass!” Offensive as this may be to some, it’s very much the Borat many fell in love with almost exactly twelve years ago. He concluded the segment by kicking things back to Jimmy Kimmel in the studio and proceeded to stay in character while describing the host. This is an example of how dedicated Sacha Baron Cohen is to his characters and his undercover comedy. In order to help keep Who Is America? a secret, Cohen didn’t do any interviews to help promote the show. This appearance on Jimmy Kimmel Live! was the first time he truly had the opportunity to discuss the series since it aired. In a rather shocking reveal, further showcasing his dedication, Cohen discussed a situation where his liberal character Dr. Nira Cain-N’Degeocello paid a visit to Kingston, Arizona, saying he was going to build a Mosque there. Because of the expected hostility, he came with a bodyguard and, of all things, a bulletproof clipboard. 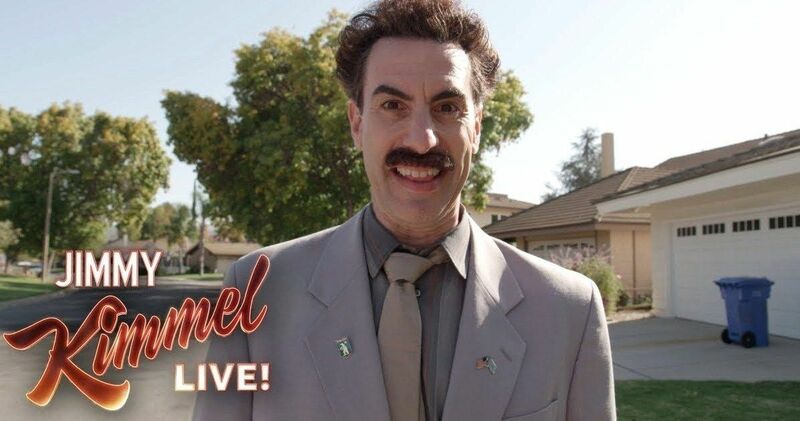 This isn’t the first time Borat has been revived, as the actor and comedian previously brought the character back in 2015, also on Jimmy Kimmel Live! In talking further about Who Is America? Cohen discussed trying to get a confession from O.J. Simpson and getting Jason Spencer to resign from office. Be sure to check out the Borat sketch, as well as the interview clips, from the Jimmy Kimmel Live YouTube channel below.